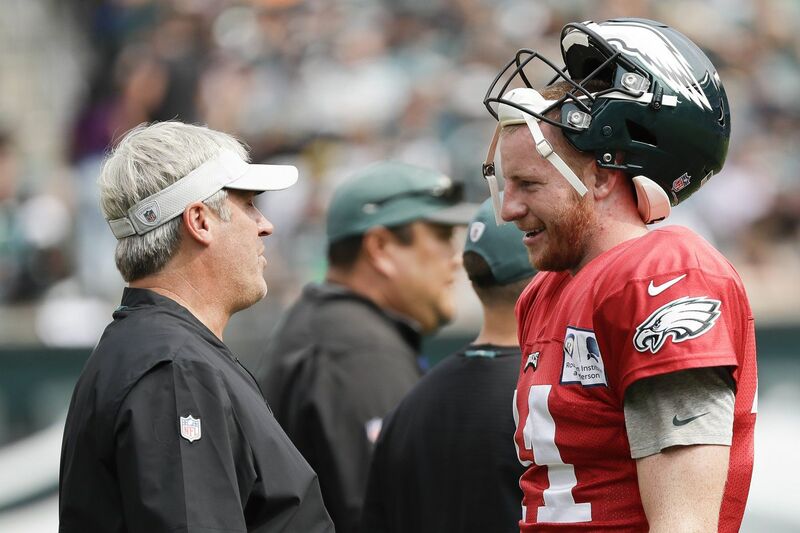 What can Doug Pederson and Carson Wentz achieve this season? This is the time of year when everybody wants to know what you think. Or, at least, they pretend that they do. Point is, they ask. At the barbershop, the fantasy draft, wherever beer and liquor are sold in open containers. So … whaddaya think about the Birds? Most years, it is an easy enough question to answer. I am the kind of person who generally thinks something and who generally possesses some degree of confidence in whatever that something happens to be. So I tell them. Two years ago, I told them that Carson Wentz looked like a potential superstar, and that Doug Pederson was a better coach than he was getting credit for, but that the rest of the roster outside of the offensive and defensive lines was uninspiring. Thus, I confidently proclaimed them to be a long way off from legitimate contention. And, after Wentz went down this past season, I told them that there was a reason Nick Foles was on his third team in as many seasons, and that the season was over. Which is why I suspect that, this year, the people who ask what I think are just being polite. Because if they really cared, they would have come away from last season with two realizations: 1. The Eagles won the Super Bowl and 2. Murphy has no idea what he is talking about. 1. I think that Wentz is going to be fine. By the time Daylight Saving Time ends, we'll have forgotten his knee was ever an issue. Comparisons are always tricky when it comes to injuries, particularly those in the knee, but the track record for quarterbacks returning from ACL surgery is solid. In 2013, Robert Griffin III was under center in Week 1 after having surgery to repair the ACL and LCL in his knee on Jan. 9. Wentz's surgery was Dec. 13. Carson Palmer and Philip Rivers both suffered ACL injuries in the postseason and were back on the field for the first game of the following season. Joe Flacco had surgery on Dec. 8, 2015, and was back for the Ravens' third preseason game the following August. None of this is a guarantee that Wentz will be on the field for Week 1. No two injuries are completely alike. For instance, Griffin's damage was in his right knee. Wentz's injury occurred in his left knee. Flacco tore his ACL and MCL. Wentz tore his ACL and LCL. Flacco and Rivers both had enough stability in their knees to finish out the games in which they suffered the injury. Wentz did not. But even if Wentz is not cleared for contact in time for next Thursday's opener against Atlanta, he should be back sooner rather than later. And once he is back, he should be fine. In Flacco's first season back, he set career-bests in completion percentage (64.9) and yards (4,317). Rivers' first post-surgery season was the best of his career to that point, with a 65.3 completion rate, 4,009 yards, and league-leading marks in yards-per-attempt (8.4) and QB rating (105.5), the latter of which remains tied for the best of his career. Palmer, like Wentz, suffered his injury in his second season in the league. He came back to throw for more yards and more yards-per-attempt than he had to that point, and with a 93.9 quarterback rating that he would not equal for another seven seasons. Griffin suffered a significant regression, but that may have been more of a factor of his not being a great pocket passer to begin with. Even then, he finished that season with more rushing yards than Wentz has for his career. 2. I think that, even with Wentz, I'd take the Falcons and the points in Week 1. I wouldn't feel good about it, mostly because Steve Sarkisian is still calling the offensive plays in Atlanta. But I'm a believer in the power of circadian rhythms, and that holds true when you scale them up to an NFL offseason. When Jason Kelce swung by Phillies spring training this spring, somebody asked him what his plans were for the rest of the offseason and he mentioned the need to nurse his body back to full health after the extra month's grind. Seven months later, we could be seeing the impact of the shortened offseason as Alshon Jeffery remains on the PUP list and Tim Jernigan remains sidelined, and Jay Ajayi has missed two weeks of practice. Factor in Nigel Bradham missing the game because of a league suspension, and it shouldn't surprise anybody if the Super Bowl Eagles take a little while to resurface. 3. I think that it will be difficult for this team not to win 10 games. After a tough Week 1 matchup, the NFL schedule makers threw the onetime underdogs a bone. Getting the Colts at home early in Andrew Luck's return is big, as is getting the Bucs without Jameis Winston. From there, five of the six games outside the division are against teams that were in the playoffs a year ago. But, then, they were 3-0 against those teams a year ago. I'm bearish on the division, with Dallas and Washington both trending downward and the Giants still facing a big question mark on the offensive line. I don't think it absurd to predict another 5-1 showing against the NFC East. Factor in wins against the Bucs, Colts and Titans in the first four games, and there's a lot of margin for error in the remainder.